(L-R): Tony Kratofil, PE; Terry Stepanski, PE; Eric Polvi, PE; Matt Simon, PE; Carrie Warren, PE; Dr. Audrey Andrews; and Ronald Brenke, PE, share the 2019 MDOT ACEC Partnering Charter Award. The I-94 Modernization Advanced Bridges Project Team within the Michigan Department of Transportation recently received the 2018 MDOT-ACEC Partnership Charter Award, which recognizes project managers and firms in Michigan for project partnerships based on trust, effective communication, continuous improvement, innovation and timely issue resolution. 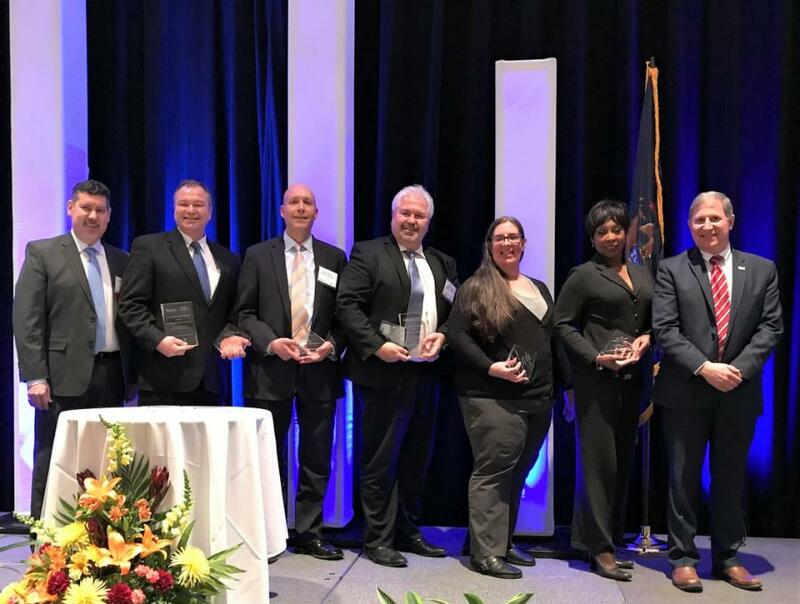 The I-94 team — consisting of professionals from Michigan DOT and the private construction firm HNTB — took home the award for their "close work" modernizing seven miles of freeway in Detroit, reconstructing interchanges, upgrading nearby streets and replacing almost 70 bridges. "The I-94 Modernization Project Team did an exceptional job of leveraging the early work on advanced bridges in the I-94 corridor to create opportunities for broad-based industry participation as well as local, small business development," noted Tony Kratofil, Michigan DOT's chief operations officer, in a statement. "The one-team approach amongst 19 individual engineering firms demonstrated what partnering is all about, and yielded outstanding results for small business growth, expanding the capacity of the Michigan consulting industry to be prepared to help address our growing infrastructure needs."